The poor monsoon is adding to the woes of the already ailing Indian economy. Industrial body CII has expressed concern over the impact of the deficient rainfall on the broader economy, at a time when there is already a sharp slowdown on account of various domestic and global factors. 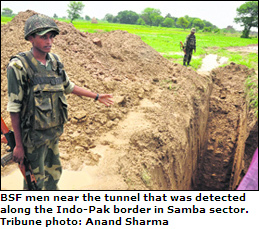 Had a retired soldier and a teenager of Chachwal village not informed the BSF about the caved-in portion of their agricultural fields, barely 150 metres from the barbed fence along the international border in Samba sector, Pakistan would have possibly succeeded in its nefarious designs to disrupt India�s Independence Day celebrations. Once again the Anna-impact came resounding at the Jantar Mantar today with a sea of supporters standing up against the corrupt system and the government for which the 74-year-old anti-corruption crusader has began yet another fast-unto-death. The Punjab Government is set to target 1.24 lakh registered manufacturers and traders, who are not paying taxes. Apart from the crackdown on tax evaders, the government, which is eagerly looking to mobilise revenue, is also planning to tax goods right from raw to finished state to mop up around Rs 4,000 crore. The government is in the process of setting up a new committee to look afresh at the modalities of the �one nation one test� idea and recommend ways to implement it across disciplines in a phased manner. Living a life of penury, the family members of Pakistan-based victims of Samjhauta train blasts, have now a ray of hope. The government has cleared decks for their visit to India to seek official compensation, which, in some cases, has been usurped by their kin staying in India.